It was a rough week and there will be more downside. But how much lower could the market go and how long could the decline last? It is, of course, impossible to tell either metric with certainty. But we can make educated guesses, by using technical tools to look at past periods of volatility and pullback, and then overlaying that analysis onto the current chart. Let’s begin this speculative adventure and take a look at the monthly time frame. The monthly chart highlights two important pullback periods for the S&P 500 index. The first is the decline associated with the 2008 financial crisis, and the second is the decline that began in the last half of 2015. It is overlaid with a moving average ribbon and a Raff regression study. At the bottom of the chart, is a hybrid indicator of my own construction, which is fairly accurate at identifying shifts in trend direction. 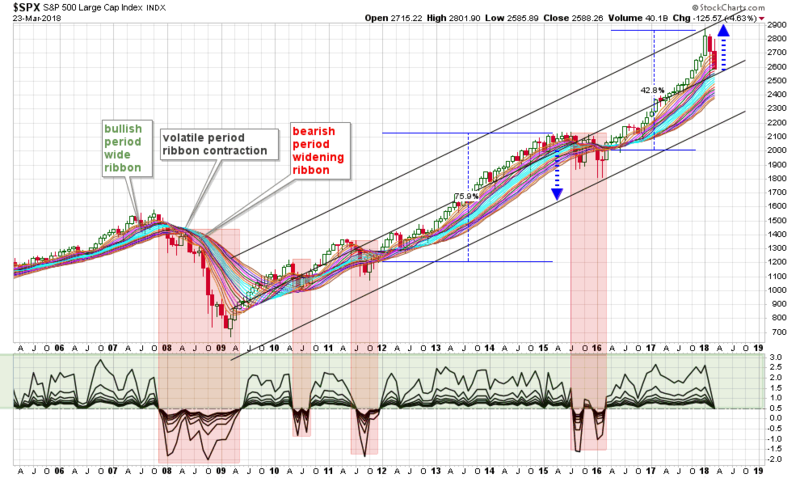 In 2007 the market was trending higher and the moving average ribbon was in a bullish configuration. The faster averages were tracking above the intermediate and long-term averages, and they were neatly aligned in parallel with no overlap. In the first quarter of 2008 they began to contract and the faster averages started to curl down like an ocean wave. As the index continued lower the ribbon pattern expanded again, this time with the faster averages leading the others lower and arranged in a wide bearish configuration. And just before this nearly 15 month corrective period began there was a bearish center line crossover on the hybrid index. In 2012 the market recovered and began a rally phase that lasted over three years and saw a 75% gain in the S&P 500 index. The hybrid index moved into negative territory again in July 2015 signaling potential trouble ahead. This warning was followed by a period of price volatility that lasted about seven months. In the summer 2016 the rally resumed and in less than two years the S&P was up another 43%. With that background let’s take a look at the indicators on the chart. On this chart the center line of the three rising parallel trend lines is the Raff regression line. It is the best-fit straight line of price over the period from 2009 to present. The parallel lines above and below it measure the largest percent move above or below the regression line. It is interesting to note that the rally above the regression line to the January 2018 high, is of the same degree as the decline below the regression line in early 2016. The slope of the long term rally on the monthly chart is positive, but it has reached an extreme level. This means that there should be some reversion to the mean, and that’s what we’re seeing now. Note the current reading on the hybrid indicator. The long term picture on the S&P 500 chart, however, remains bullish. The index had diverted by a large percentage above the regression line and at the current time is looking somewhat unstable. 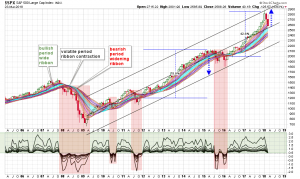 It is in a reversion phase now and while ultimately that could be healthy for the index, for investors it is a matter of how deep and how protracted the pullback could be. Let’s move to the weekly chart for a little more detail on that. It is highly unlikely that we’re going to see another decline like the one in 2008. At that time the banking system was under tremendous pressure and major financial institutions were in danger of failing. The fundamental case today for banks and economy in general is positive. 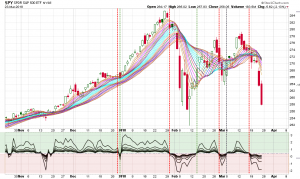 The volatility we’re seeing in the market right now is the unwinding of an overbought condition, and it doesn’t take much of a reason (there seems to be a new one every day in the financial news) for the process to unfold. So I think it is more relevant to review the 2015/2016 pullback period, as it pertains to the current one, rather than the 2008 decline. The reversion process that began in late 2015 lasted six months. It started with an initial drop of 12%, followed quickly by a rebound of 13%, and completed by the index making a new low in early 2016. The overall decline was about 15% from peak to trough. The recent volatility began only three months ago. It started with a drop of about 12% in January, followed by a 10% rebound in February, and then a second pullback phase this month. The action by the index over these two periods is strikingly similar, and if our current decline ultimately pulls back 15%, like the 2015 overall decline, it would mean that we have about 6% more downside. The market could handle that kind of a reversion, but I don’t think it would like it if it took another three months to play out. In any case, whatever amount of time it takes, if history rhymes, it should only be corrective and not a full blown bear market. 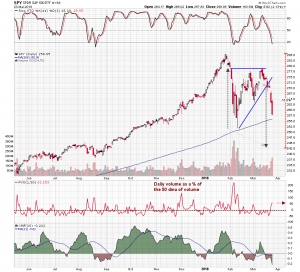 The first daily chart is of the SPDR S&P 500 ETF (SPY) and includes Fibonacci retracement levels measured off the 2016 low and this year’s January high. If there is a 15% decline off the recent high, similar to the 2015/2016 decline, it would take the SPY back down to the $243 area. This is also the 38% retracement level of the 2016 and 2017 range. The second daily chart is another ribbon chart with the hybrid indicator. 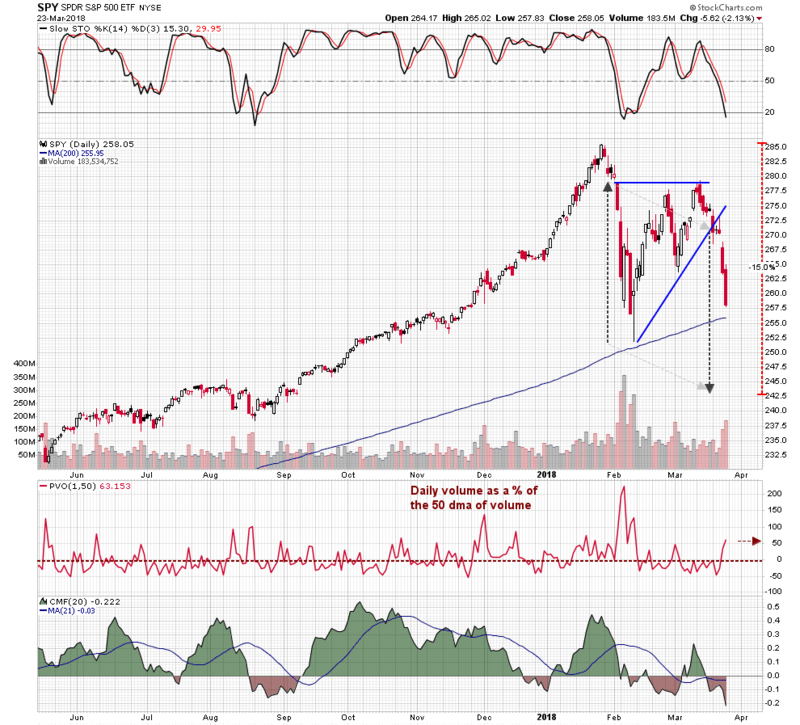 Looking back at the sharp drop in February the bearish ribbon curl can be seen clearly. Is not so obvious right now but another bearish curl is currently underway. The hybrid indicator moved into negative territory last week, as it did in January prior to the February decline, and in late March. One of the things that I like about this particular indicator is that it seems to work well in volatile periods, unlike many other indicators that get whipsawed. This last daily chart includes the support and resistance lines that I have been using to denote a triangle pattern that has formed on this time frame. The pattern price objective of the triangle is measured by taking the height of the triangle and subtracting it from the break down point. It projects a downside target in the $242 area, which would be a 15% move off the January high, equivalent to the 2015/2016 overall decline. This corroborates the technical indications on the prior charts. The best case scenario over the short term would be for a hammer-like or long tail “doji” candle to form after testing the 200 day moving average, just a few points away. If a hammer were to form at the average and was followed by a strong rebound in price, the three-period candle action would form a morningstar pattern, a reliable bullish reversal pattern. The inference would of a V-shaped reflexive bounce and then all would be right with the market. But that is the best-case scenario. At this point in time, stochastic oscillator is entering an oversold condition like it did in early February. Overall volume picked up over the last two trading sessions but is only about 63% the greater than the 50 day moving average of volume. In February it spiked over 200% above the 50 day average. Chaikin money flow has moved into negative territory and the 21 period moving average dropped below the center line this month. That was not the case with the signal average back in February and is a concern, but the indicator does not reflect panic selling. You can’t close out a bad week or a down Friday without references to the 1987 Black Monday that followed the Black Friday. The internet is peppered with this video of the great Martin Zweig making his famous “crash” call on the old Wall Street Week program. For those old enough to remember Louis Rukeyser and his corny humor, the video is a trip down memory lane. Marty Zweig comes in with his call around 6:50. — and finally, the triangle measured move targets the consensus 15% overall downside price projection or another 6% lower. These are educated guesses based on technical patterns that have played out in the past. This analysis is an intellectual exercise and if the S&P does move another 6% lower, it does not guarantee the decline is over. 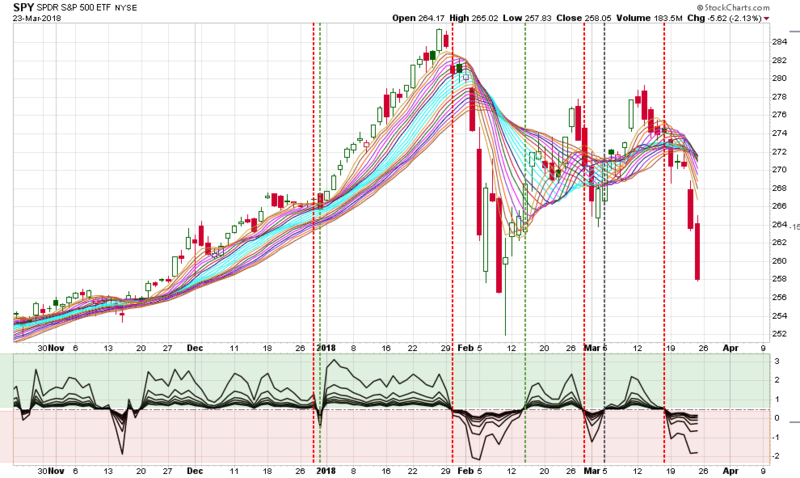 A V- shaped reflex bottom would require multiple days of confirmation and might not even occur this time, even though many market participants have become accustomed to this type of rebound in price. Recovering from this decline however deep, may necessitate a prolonged period of horizontal basing. Remember the process took six months in 2015/2016 and we are less than three months into the current one. We have a shortened trading week coming up and volume will be light. Volatility should remain. Be cautious and be patient.